WASHINGTON, Sept. 5, 2018 /PRNewswire/ -- A comprehensive report issued today by the American Sleep Apnea Association (ASAA) details the magnitude of human suffering, barriers to diagnosis and treatment, and unmet needs described by people living with sleep apnea and family caregivers. 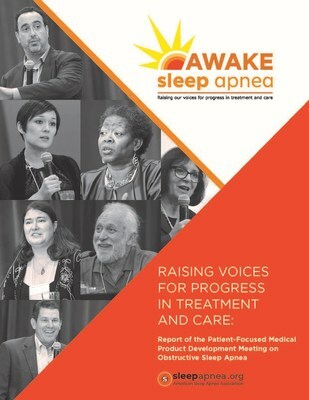 "Raising Voices for Progress in Treatment and Care" is based on first-person accounts conveyed at the June 8, 2018 AWAKE Sleep Apnea patient-focused medical product development meeting attended by 465 people (in person and by live webcast) and a Patient & Caregiver Survey that attracted responses from 5,630 adults of all ages from around the country. "This report, released as part of ASAA's annual Sleeptember awareness events, is essential reading for anyone dealing with sleep apnea – diagnosed patients, symptomatic individuals and those at risk for the condition, family members, healthcare professionals, drug and device developers, researchers, and regulators. It is the most complete account of sleep apnea from a patient point-of-view in existence," asserted Adam Amdur, ASAA's chief patient officer. "The powerful testimonies delivered on June 8 and through the survey illustrate the good, the bad, and the ugly of the patient journey with sleep apnea; these testimonies also chart an advocacy agenda to address our community's many and varied unmet needs." CPAP was the most-cited therapy in response to the open-ended survey question, "What have you found that helps the most," yet there were many caveats and persistence was required to determine and maintain effective machine settings, find a well-fitting mask and good seal, and to properly clean and maintain equipment. More initial instruction, ongoing support, and better customer service were sought by many CPAP-treated individuals. 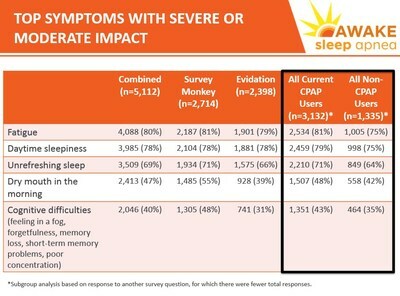 With 5,630 responses, the AWAKE Sleep Apnea survey is the largest undertaken in conjunction with a patient-focused medical product development meeting conducted in collaboration with FDA. ASAA used a combination of traditional and social media channels to attract respondents to the 32-item survey; 12 partnering organizations helped extend outreach. ASAA also partnered with Evidation Health to deploy the survey within Evidation's consumer health "Achievement" platform. Fifty-six percent (56%) the survey responses came through ASAA and partnering nonprofits and the remainder came through Evidation. In general, respondents via the Achievement platform were younger, less severely affected, less likely to have been diagnosed by a physician, and were using fewer medical treatments. Where significant differences were found between the two cohorts, they are reflected in the report. The AWAKE Sleep Apnea education and empowerment initiative launched on April 24, 2018 in preparation for the June 8 meeting with FDA officials. It was the first campaign of its kind for sleep apnea. ASAA applied to host the meeting as part of FDA's expanded patient engagement efforts to help regulators understand what individuals living with various conditions experience, which symptoms present the most difficulty, which treatment benefits matter most, and how they perceive potential risks and harms associated with treatment. The report and survey results will be submitted to FDA's Patient Experience Resources archive. Additional data analyses will form the basis of manuscripts submitted to peer-reviewed publications.